Water, Tomato Paste, Juice of (Carrots, Celery, Beets, Parsley, Lettuce, Watercress, Spinach), White Grape Juice Concentrate, Potassium Chloride, Natural Flavours, Carrot Juice Concentrate, Ascorbic Acid (vitamin C), Salt, Seasoning. and Citric Acid (pH adjusting agent). Natural Source of Beta Carotene. Two full serving of Vegetables. Only 52 calories. No sugar added. No additives or preservatives. 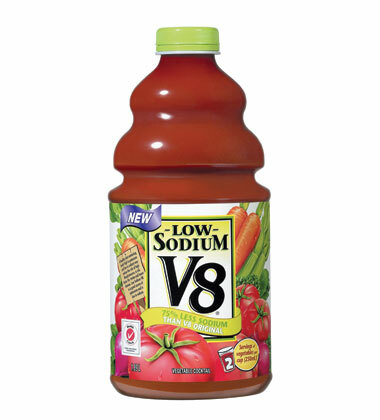 18 mg of Lycopene. Low Sodium.